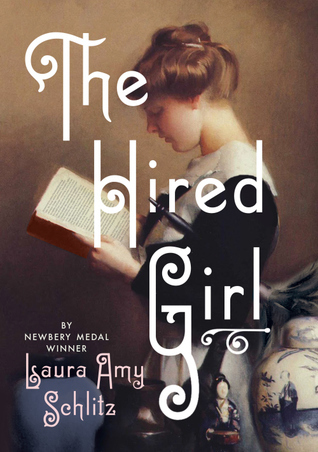 The Hired Girl by Laura Amy Schlitz. Grades 6-10. Candlewick Press, September 2015. 400 pages. Reviewed from ARC provided by publisher. Sick of the demands and abuse her father heaps on her after her mother passes away, fourteen-year-old Joan runs away from the family farm to seek work as a hired girl in Baltimore. The year is 1911 and Joan ends up with a position in a society house. She's determined to take advantage of the city with all its cultural opportunities; her mother always wanted her to become a schoolteacher. But life in the city and life as a hired girl is much more overwhelming than Joan anticipated. Inspired by the author's grandmother's journals, this is a rich story about turn-of-the-century society, religion, romance, and more. Oh, I loved this book, but with its early-1900s setting and plucky girl heroine, it was pretty much made for me. That's my favorite period to read about and the book reminded me of a couple of my all-time favorite books. The beauty of this book is that it's written simply, but it delves into many complex issues without getting too weighed down by them. I completely bought Joan's voice and it really felt like I could have been reading someone's diary. The realistic voice immersed me in the story and I found myself not wanting to put the book down. Joan is a little flighty, quite taken with all the new clothing she can buy now that she has a salary, but she's also a religious girl. Her quest to join the Catholic Church (her mother was Catholic) is sometimes at odds with the reform Judaism practiced in her master's home. Joan ends up learning quite a lot about both religions and dealing with conflicting feelings. This, also, speaks to the realistic nature of the book, as religious questions are something a lot of 14-year-old girls deal with. I appreciated the glimpse into a 1911 Jewish household and really came to love every character in the book. Supporting characters are just as engaging as Joan herself and they're finely and completely drawn. Overall, I just loved it and I would love to read more and more about Joan's adventures in Baltimore. Daddy Long-Legs by Jean Webster. This is an all-time favorite of mine, a classic that was written around the same time that The Hired Girl is set. It also features a plucky, intelligent heroine who longs to be educated and the book follows Judy's journey to college. A Northern Light by Jennifer Donnelly. This is ANOTHER all-time favorite of mine (you can see why I feel that The Hired Girl was designed for me). Mattie Gokey's story about taking care of her family while longing to go continue her education hits many of the same notes as Joan's.